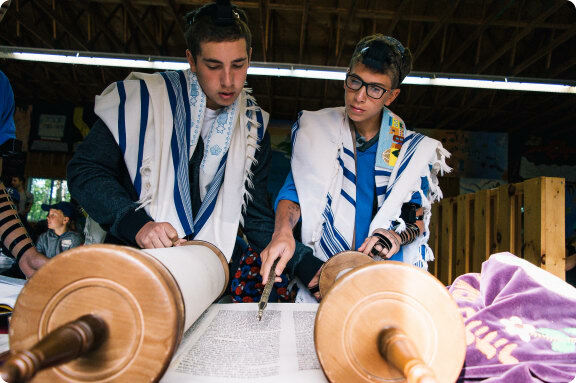 As a traditional Jewish camp, we enjoy morning tefilot, with the Torah being read on Mondays, Thursdays, and on Shabbat. 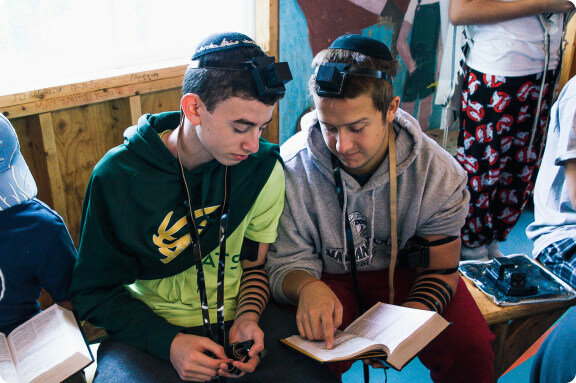 Boys over the age of thirteen are expected to bring and wear their tfillin. Our Torah is kept in our hand-made Aron Kodesh, which is decorated with artwork by our campers and staff. 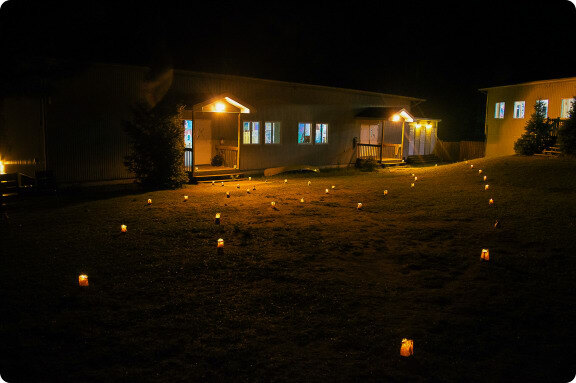 Shabbat is a spiritual and relaxing time at camp. Shabbat begins with Friday evening mifkad, where everyone comes to flagpole dressed in beautiful clothes, ready to welcome in Shabbat. The boys head in to the ulam and the girls head to the chaddar for candle lighting. A lively Kabbalat Shabbat and a delicious Friday night meal follows - including z'mirot and dancing. During morning tefilot on Saturday, our staff and campers share the responsibility of reading the weekly parashah, with stories and skits being performed around the weekly theme. The younger kids head to the migrash for a story and discussion. After kiddush and lunch, campers enjoy an extended rest period to catch up on an eventful week. Shabbat afternoon activites include board games, ping pong and tetherball, learning, and "just chilling". After snack, units split up for Shabbat afternoon programming. This is usually an activity led by a guest educator who's up at camp for Shabbat. The camp reunites for shira in the kikar, followed by a dairy dinner. After free time, there is Ma'ariv and Havdallah. Each week a different bunk is responsible for that Shabbat - including a mifkad dance, setting the tableware, handing out Shabbat-o-grams, a d'var torah during prayers, leading shira, and a dinnertime story. Tisha B'Av at Camp is an unforgettable experience. We invite our alumni up for a special evening dinner, presentation, and Aicha. Our Tisha B'Av tableau presentation are a series of skits performed by our campers re-enacting tragic moments of Jewish history in a candle-lit setting. The whole camp then meets on the Agam for ceremony, followed by Aicha by candlight in the Ulam.